The bible is a book that presents eternal truths in rich vivid imagery. To better understand God’s teachings, it is imperative that we have a working knowledge of the meaning and usage of biblical imagery. To help us accomplish this goal we will explore the biblical imagery of salt. The most obvious references to salt’s positive qualities emphasize its abilities to season foods. Job asked, “Can that which is tasteless be eaten without salt?” (Job 6:6). Paul instructed the Colossians, to “Let your speech always be gracious, seasoned with salt, so that you may know how you ought to answer each person” (4:6a). When applied to conversation about the gospel with “outsiders” (i.e. unbelievers), the faithful are to speak wisely, making their explanations of the Christian life interestingly tasteful to the inquirer. Not only was salt used for food stuff, but in medicine as well. Thus, Elisha miraculously “healed” the bad waters of Jericho by throwing salt in the city’s spring (2 Kings 2:19-22). Upon arrival, it was customary for newborn babies to be bathed and rubbed with salted (Ezekiel 16:4). It is believed that the salt not only cleaned but toughened the skin for the harsh life of the ancient world. A “covenant of salt” symbolically captured the preservation qualities of salt. God commanded the Israelites to, “Season all your grain offerings with salt” (Leviticus 2:13) as well as with some animal sacrifices (Ezekiel 43:23-24). Thus salt served as a constant reminder of Israel’s permanent covenant with God. Moreover, the Levites right to partake of the “holy contributions that the people of Israel present[ed] to the Lord” was an inviolable “covenant of salt forever” (Numbers 18:19). Additionally, “the Lord God of Israel gave the kingship over Israel forever to David and his sons by a covenant of salt” (2 Chronicles 13:5). When the children of Israel left captivity under the leadership of Ezra, unlimited amounts of salt were provided for the people’s personal and sacrificial use (Ezra 6:9; 7:22). Because they ate “salt from the palace” (Ezra 4:14) Israel’s enemies felt honor-bound to inform king Artaxerxes of the rebellious nature of the Jewish people. Geographically speaking, areas where salt abounded were harshly barren and unfruitful. Therefore, the prophet Jeremiah likened a heart without the Lord to the “parched places of the wilderness, in an uninhabited salt land” (17:6b). Abimelech cursed the city of Shechem by razing it and sowing it with salt (Judges 9:45). The Salt Sea, or Dead Sea, area of southern Israel had once been “well watered” and lush like “the garden of the Lord” (Genesis 13:10). However, in judgment against the sins of Sodom and Gomorrah, God made the place a wasteland of salt. In turn, the barrenness of this salt land became a powerful image of death and destruction. Moses, in his farewell sermon, warned the people to not turn away from God lest the land become “a burning waste of salt and sulfur – nothing planted, nothing sprouting, no vegetation growing on it… like Sodom and Gomorrah… which the Lord overthrew in his anger and wrath” (Deuteronomy 29:23; cf Psalm 107:34; Zephaniah 2:9). Additionally, our Lord Jesus pointed to Lot’s wife, (who disobediently looked back at the destruction of Sodom and Gomorrah and was immediately turned to a pillar of salt, Genesis 19:26), as an example of failing to obtain deliverance by looking back and longing for what is lost (Luke 17:32). In the gospels, the Lord used salt imagery in His teachings on three different occasions. First, in the Sermon on the Mount, he instructed His followers to be, “The salt of the earth. But if salt has lost its taste, how shall its saltiness be restored? It is no longer good for anything except to be thrown out and trampled under people’s feet” (Matthew 5:13; cf. Luke 14:34-35). Since Jesus mentions “taste,” it is most likely that the usage of salt in this context is as a seasoning agent. 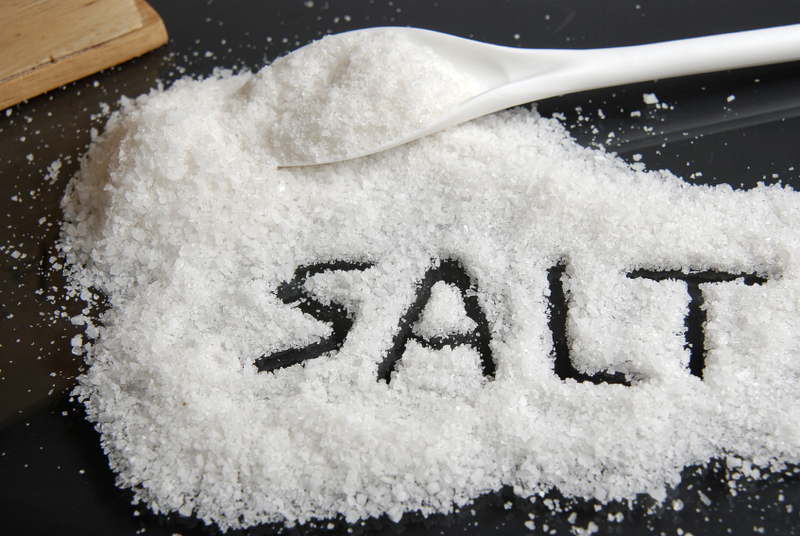 Salt imparts flavor and improves the taste of bland food. Therefore, contextually, being salty is to live out the beatitudes previously listed in vv. 3-12, helping those around us develop a taste for Jesus and the Christian life. However, just as impure salt can lose its ability to flavor foods and is therefore worthless, impure Christians can also lose their ability to be salty and consequently are worthless both to God and man. Two additional verses concerning salt appear Mark’s: “For everyone will be salted with fire” (9:49) with the KJV adding, “and every sacrifice shall be salted with salt.” This is a hard statement to interpret, perhaps the best explanation is that as salt purifies and preserves, Christians will be purified and preserved through the fiery trails and temptations (cf. 1 Peter 1:6-9; James 1:2-4). Additionally, He added “Have salt in yourselves and be at peace with one another” (9:50b). He is saying; see to it that you retain in yourselves those precious qualities that will make you a blessing to one another, and to all around you. Finally, James taught the inconsistent nature of blessing God with our tongue one minute, but cursing one made in God’s image the next by rhetorically asking, “Does a spring pour forth from the same opening both fresh and salt water?… Neither can a salt pond yield fresh water” (3:11, 12). Just as a spring cannot produce two types of water, so also, believers are not to bring forth blessings and curses from their mouths. The imagery of salt teaches us many incredible lessons. It is interesting how it makes land infertile yet is so necessary for life. In sea survival training in the Air Force we were shown how to use solar distillers that were in survival gear at that time. They produced pure, distilled water. We were warned that we should always dip our fingers in the sea and take a few drops of the sea water as we drank the distilled water because without the salt from the sea water we would possibly die, I believe from electrolyte imbalance. Our Creator made this salt for our benefit. Thank you for sharing your thoughts Don and everything else you do for the Lord’s kingdom.